There are numerous reasons why this stamp is wanted by collectors. The first is that the artwork is beautiful for a stamp and the other reason this one is highly-prized is that the 24-cent stamp uses a “G” grill and has a basic gum, split grill or double grill. If you have an unused sample with an inverted center, it is said to have a value of around $275,000. This stamp was part of a collection of ten stamps that had a value of between one and 90 cents. This series of stamps was the first to use bicolor printing and was frequently criticized for the puzzling arrangement of colors. It made the stamps look poorly designed. As you could expect, its value derives not from the fact that it was the first stamp to be printed using a new method but because some of the stamps got inverted during the printing process. If you can find an unused sample that has inverted flags it could be worth about $200,000 and a used one will still get you around $65,000. Not unexpectedly, the first president of the United States was significant feature in several stamps. 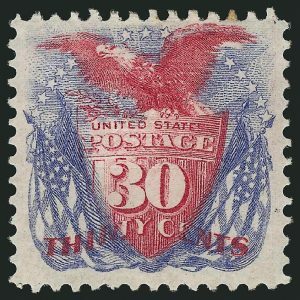 This stamp is well-known by philatelists as the Washington-Franklin issue and part of the attraction to collectors is the fact that only a part of the U.S Postal Service watermark is on the stamp and every stamp was different with the watermark going backwards, sideways or topside. An unused pair is estimated to have a value of $100,000.